Over the course of the past week, I’ve pushed through a couple of updates to Top 10. This version brings several new features, some bug fixes and enhancements to existing features. Below are some of the main additions to Top 10. Top 10 v2.2 introduces an inbuilt caching system. Tapping into the Transients API, the plugin will cache the popular posts output for an hour which results in highly reduced queries for results after the first post. This is ideal for blogs with limited traffic and especially those that aren’t particular about displaying the post count. This will work in conjunction with caching plugins so turn one on and get the instant performance boost. You can enable this under General Options. The clear Cache button will, as the name suggests, clear the cache. 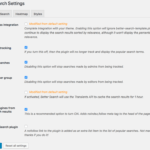 Resaving the options page will also clear the cache. Top 10 has, in previous versions, included a default style. This was limited to a single style and you had limited flexibility in the size of the thumbnails or what could be displayed. The current version of the styles interface is smarter. 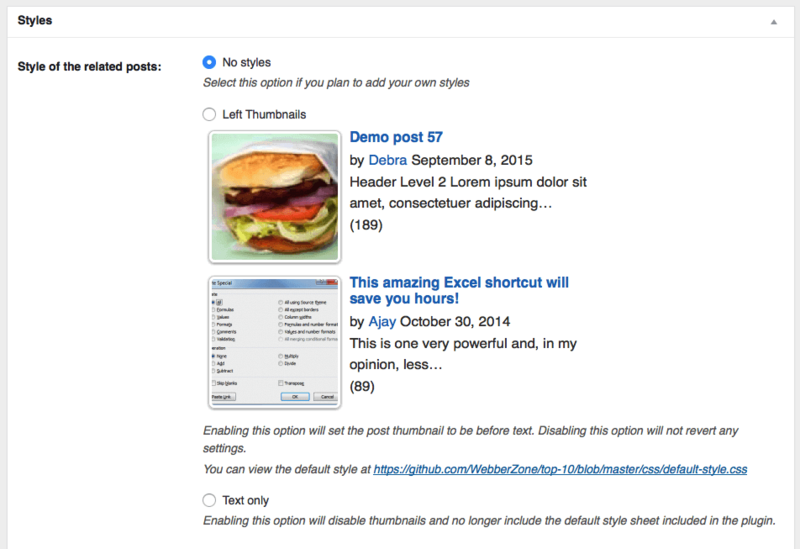 Choose No Styles if you’re using your own styling system of choose Left Thumbs for a new optimised set of styles. 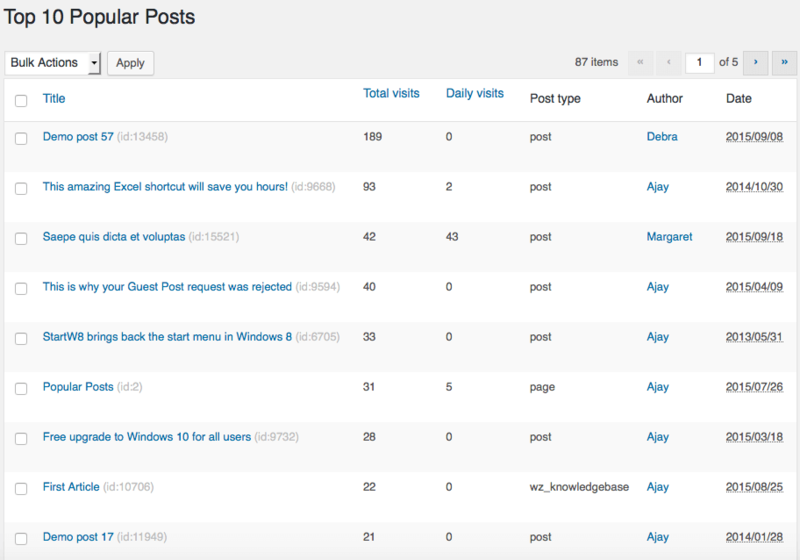 By default, the popular posts list will display all your tracked posts irrespective of how old they are. This new option will allow you to limit the posts to a specific age. e.g. 365 will only show posts published in the last year. Note that all posts will continue to be tracked. Top 10 v2.2 introduces two additional options which I believe are very useful. The first one will simply turn off the popular posts on a the page/post that you select this on. The widget will no longer display. 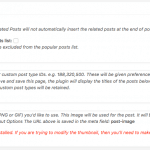 It’s for those select times when you want to exclude the display on certain posts. The second option is more useful and complements the existing “Exclude post IDs” option. By selecting “Exclude this post…”, you will stop it from being displayed in the top posts list. This is especially useful if you’d like to exclude certain posts like landing pages, home page, blog page, etc. 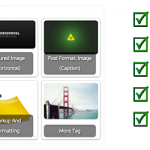 which the plugin will track because of their post type. The admin top posts screen has been revamped with a cleaner, sortable interface. 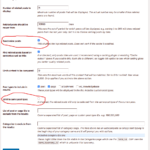 Additionally, you also have the option to delete the counts either selectively or in bulk. Choose to sort the posts by either ascending or descending. Sorting the Daily column in descending order will show you the popular posts for the day (or custom period set in Settings). 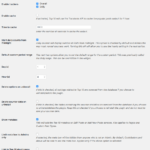 As usual, if you got a support query, then please create a new post at the WordPress.org support forum. It is the fastest way to get support as I monitor the forums regularly.